The 2017 Clan Parliament and Gathering were a great success! We had a good number of Clan members (63) from throughout the world (counts from each country at the end of this article). Twenty-six members went on to Colonsay. The accommodations at Stirling University were quite comfortable and the people from the University worked hard to take care of all our requests. They had a large conference room in which to hold our meetings, as well as a large dining room that could be used after dinner for a family ceilidh. The Stirling area was a perfect place to hold the Parliament as it is replete with wonderful Scottish sites! Stirling Castle, only 5 minutes from our hotel, is the grandest of Scotland's castles and one of the most popular visitor attractions in the country. Sitting 250 feet above the plain on an extinct volcano, Stirling Castle became the strategic military key to the kingdom during the 13th and 14th century Wars of Independence, and was the favourite royal residence of many of the Stuart Monarchs. The William Wallace Monument to "Braveheart" was less than 20 minutes away and was visible from most of the town of Stirling. A high point was the "Kelpies," about 15 minutes from Stirling, which are breathtaking, 30 metre high, 300 tonne, silver horse heads that glisten in the sun and symbolize the super natural water horses of Celtic myth that were believed to haunt the rivers and lochs of Scotland and Ireland. The one disappointment at Parliament was that our illustrious Clan Commander Iain was unable to attend due to problems organizing the proper health care while he was in Stirling. However, Andrew Duffy, an Armiger and Commissioner for Scotland, handled the Parliament proceedings in good form. Scotland Society President, Bob McFie, welcomed all to the Parliament, and gave a short presentation on the history of the early members of Clan Macfie. History states that they were mainly "tinkers," and Bob explained that although many believe that "tinkers" was a less than honourable profession; it was in fact quite the opposite. Tinkers were travelers who went from village to village repairing and selling pots and pans and other instruments needed for cooking. The villagers looked forward to their arrival. 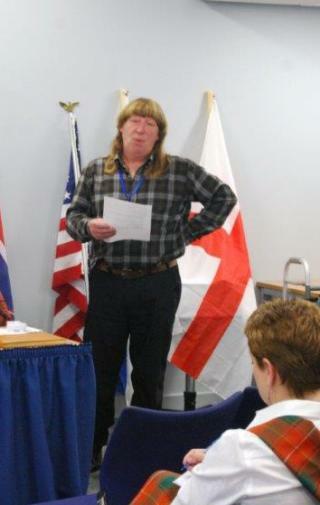 He then went on to talk about "ceilidhs" and explained what they were. Bob stated that the Macfie Clan was famous for its active ceilidhs and encouraged everyone to take part in them. Members can sing a song, dance, play an instrument, read a poem or tell a story...whatever they choose. Remembrances were shared of beloved Clan members we have lost over the years: Norah McPhee, Australian Society; Heleen van der Leest, The Netherlands; and David Russell, the Scottish Society. I'm sure there are many more that I'm missing here. All worldwide Society Presidents submitted written reports on their Societies, as did Clan Treasurer, Finlay McFee, and Nomenclature Chair, Andrew Duffy. All other committee chairs gave oral reports and volunteered to remain in their positions for the next 4 years. Vanessa Macfie volunteered to chair the "Memorials and Trust" committee. Our Clan has placed benches on Oban as well as the Battle of Culloden site. They have a commemorative plaque from our Clan on them. Commander Iain McFie currently holds the title of "Keeper of the Records." Alastair Scouller stated that he currently has many boxes of Macfie Clan information and history. Fiona stated that the Commander also has many boxes. Andrew Duffy volunteered to become "Keeper of the Records" and collect the boxes and manage having them digitized. Vanessa Duffy volunteered to make a list for publication of the books that are currently boxed. 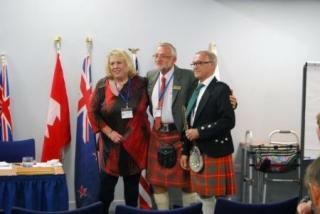 James McPhee, Armiger and Commissioner from the New Zealand Society, introduced Pär-Magnus Hagman, Swedish Society; Ian McPhee, Australian Society; and Linda McFee Gilcrest, U.S. Society; as Clan members who have petitioned the Lord Lyon's Court to become Armigers, but have been advised that there is currently a year's backlog for same. Donna McDuffie Infantino, representing the MacDuffee Clan Society of America, gave an interesting presentation on their Society's successful Scholarship Program, which has been very well received. 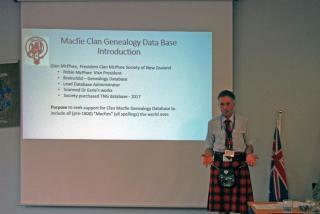 Glen McPhee, President of the New Zealand Society, gave a presentation on their current Genealogy Project and asked for volunteers from the rest of the world-wide societies to join in the project. New members of the committee are Jane Strauss and Nancyanne Carkeek from the United States; Robin McFee and Finlay McFee from the Scottish Society; Gary MacPhie from the Canadian Society; and Lynn Morgan from the Coffey/Coffee Assoc. in the United States. Finlay McFee, Treasurer and Trustee, reported on Clan finances, and presented an update on the Macfie Trust. It was unanimously approved to increase the number of Trustees from the current number of 2 (Commander Iain and Finlay) to 5. Finlay will discuss this with Commander Iain and proceed with the increase in Trustees. Trustee Finlay also updated us on an ongoing problem with past due taxes on the property on Colonsay where Chief Malcolm's Standing Stone is located. Finlay is currently working on resolving this issue. An update will follow in a future issue of the Clan Macfie News. Questions were raised about the maintenance of the area around the Standing Stone on Colonsay. Alastair Scouller, who has a home on Colonsay, volunteered to look into the maintenance issue and arrange to have the area cleaned up and maintained on an ongoing basis. He will report back to Finlay on the associated cost. Bob McFie, President of the Scottish Society, stated that due to the popularity of his first book of piping music, all of which was composed by him, he is now working on a second book. Both books of music will be available through Kilts and More website. There was a significant amount of time spent discussing the next Gathering. Our typical 4 year span between Gatherings would put our next Gathering in 2021. However, the Commander sent word that we may want to wait until 2023 to honour the 400th anniversary of the death of Chief Malcolm, the last Chief of the Macfie Clan, who was killed on Colonsay in 1623. Those present felt that it was too long to wait between Gatherings. It was brought up that Scotland is sponsoring an "All Clan Gathering" in 2019 and it was suggested we may want to participate in this. Many present were enthused about this so it was suggested we may have a "Mini-Clan Gathering" in 2019 in order to participate in the All Clan Gathering. Jane Strauss suggested having the Mini-Gathering in June of 2019 to honour the 300th anniversary of the Battle of Glen Shiel, a major battle in Scottish history. No firm decision was made. Vanessa Macfie, Ireland, and Jane Strauss, the U.S., will co-chair a committee on the Mini-Gathering. Lorraine and Finlay McFee as well as Vanessa and Andrew Duffy will co-chair the next official Parliament and Gathering. Please feel free to share your opinions on these plans with them. Christer Hemberg, President of the Swedish Society, reported that this year is the 80th anniversary of their Society. They currently have over 100 active members. Their next triennial meeting will be held in Gustafsberg, Sweden, in 2019. All Clan members are invited. The Parliament was adjourned at 12:00 PM on Saturday, 9 September 2017. Scottish Society, 9 members; Canadian Society, 5 members; Australian Society, 1 member; Ireland, 1 member; India, 2 members; New Zealand Society, 6 members; United Kingdom, 5 members; Swedish Society, 8 members; United States, 26 members.